Culinary instructor Diana Gale has a collection of close to 700 recipes, but butter cake remains one of her favourites. The 44-year-old Singaporean says: "One of my best childhood memories is eating my mother's homemade butter cake. As a child, eating cake fresh out of the oven and hot was the most wonderful thing on earth to me." Her mother encouraged her to try making butter cake when she was 10 and that sparked an interest in cooking and baking. Mrs Gale, whose husband is Australian, says: "I picked up baking because as I grew up and tasted more butter cake, I was struck by how different they tasted from my mother's. I wanted to find out how to make the perfect butter cake that was not too dense and not too sweet. "I like how versatile butter cake is. It is a basic cake which you can build upon and use to express your creativity." She developed a greater interest in cooking when she moved out to live on her own at the age of 21. "My mother gave me her cake mixer and as I had more time to myself, I began to bake more often. I would read cookery books and search for recipes online," she says. Despite her love for cooking and baking, she had no interest in pursuing a culinary career as her childhood ambition was to be a teacher. She was a secondary school teacher for five years and then a private English and mathematics tutor for 14 years. She starteda blog (thedomestic goddesswannabe.com) in 2012 to archive her recipes online and share them with her friends. "My friends often asked me for my recipes and it took time to search for them. I thought a blog would save me more time as they could look up the recipes on their own," she says. She also wanted to collect her recipes for her children, who are aged eight and six. Many of her recipes come from her mother, aunt and grandmother. The blog created opportunities for her to conduct cooking demonstrations at malls and events. When it led to more workshops and classes, she gave up her tutoring work and became a culinary instructor instead. She recently launched her first book, The Domestic Goddess Wannabe Bakes. Published by Epigram Books, it features more than 80 baking recipes that include items for breakfast and dishes for celebrations. It is available for $44.90 before GST at major bookstores and online at shop.epigrambooks.sg. 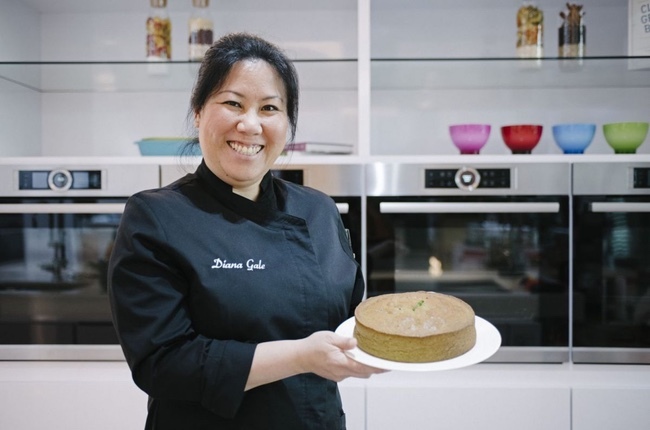 Here, Mrs Gale shares a recipe for Pandan Coconut Butter Cake, which is featured in her book and is a spin on the basic butter cake. She came up with the recipe in 2015 as she wanted to inject local flavours into butter cake. "Pandan and coconut are a classic match and I felt it would go well together in a butter cake, which is easier to bake than a chiffon cake." For a lighter texture, she uses the egg-separation technique, in which the yolks are whisked separately from the whites before being combined in the batter. She uses commercially available pandan paste and coconut milk as she finds that they give more consistent results. "If you make pandan juice from raw pandan leaves, the result varies with the quality of the pandan leaves," she says. Self-taught in cooking, Mrs Gale is an advocate for simplifying cooking so that anyone who picks up her recipes can execute the steps on his own. "People avoid cooking or baking because they think it is complicated or that there is too much washing up to do," she says. "But it is possible to cook using a few simple ingredients and even if you don't have a cake mixer, you can still bake a basic cake using a wooden spoon and a mixing bowl." In a mixing bowl, cream the butter and 140g of the sugar until the mixture turns light and fluffy. Add the egg yolks, one at a time, and mix until combined. Mix the flour and baking powder. Fold half of the flour mixture into the batter, followed by the coconut milk and pandan paste. Then fold in the remaining flour mixture. In a clean mixing bowl, whisk the egg whites until soft peaks form. Gradually add the remaining 50g sugar and whisk until firm peaks form. Transfer one-third of the meringue into the egg yolk mixture and beat to mix. Then gently fold the remaining meringue, in two batches, into the cake mixture until no white streaks remain. Pour the batter into a lightly greased 20cm round cake tin. Smooth the top and bake in the preheated oven for 40 to 45 minutes, or until a skewer inserted into the centre of the cake comes out clean. Leave to cool in the tin for five minutes before turning out onto a wire rack to cool completely.